Verdicchio is a great spring wine: refreshing citrus fruits, playful acidity, and complex minerality are its hallmarks. Incredibly, this wine is all free-run juice (no pressing!). Marchetti’s family has been making Verdicchio for four generations, and it shows. 750 ml (Italy) $12.99 Save $3.00. Nugget’s house-made salsa and guacamole are loaded with amazing flavor, and better yet, they’re on sale this week! Salsa $4.99lb., save $1/lb. Guacamole $6.99/lb., save $1/lb. Hydrate and revitalize your skin with Alba’s unique blend of pure botanical extracts. Natural emollients and soothing aloe vera nourish, moisturize and gently cleanse for soft, healthy skin. Save $5 on Alba Value Size Body Wash this week. Stop by the Woodland Nugget Market for our Ladies Night In free makeover event, featuring Gabriel cosmetics, from 3:30 to 6:30 PM on April 2nd. Free gift with purchase. Prices valid 3/16/2011 – 3/22/2011. When baby artichokes are in season, they are so good you can eat them whole. 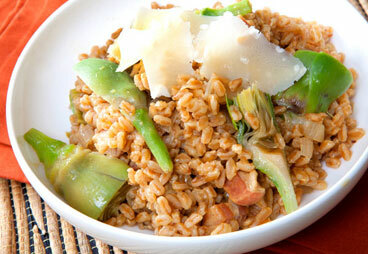 Here is a recipe the also incorporates one of our favorite grains, farro. This technique is not unlike risotto, but without the buttery finish. The weatherman finally brought us some sun! 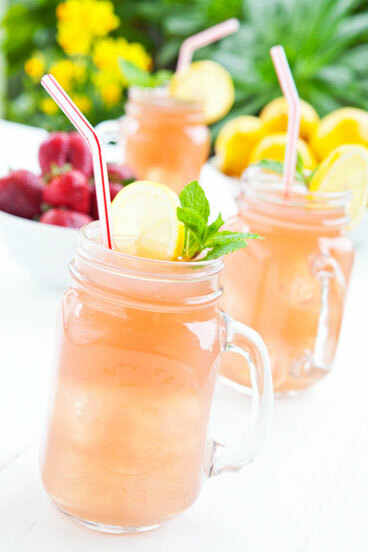 Celebrate springtime with a glass of homemade strawberry lemonade. And for the adults out there, you can add a dash of vodka with our Spiked Strawberry Lemonade recipe. With winter’s cold melting away, a wealth of springtime produce emerges, ready to refresh your health. Artichokes: One medium-sized artichoke (which is actually a flower bud from the thistle family) has only 60 calories, but it supplies more than 25 percent of the daily value for fiber and vitamin C. A study in children with asthma showed they breathed easier when eating a diet rich in vitamin C.
Asparagus: A cup of steamed asparagus spears supplies a staggering 65 percent of folate needs (and low intake of this B vitamin is linked to heart disease.) 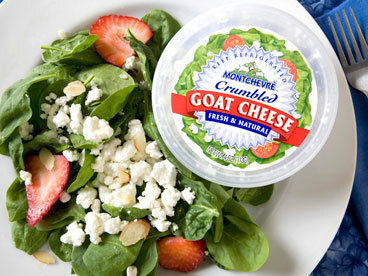 Add to stir-fry, steam lightly and add to salads, or roast or grill quickly for a tasty side dish. Beets and beet greens: Beets owe their bright red color to betacyanin, which also acts as a potent cancer fighter. And beet greens are loaded with carotenes known to protect eyesight. Serve in salads or roasted alongside lean meats or fish. Dandelion greens: These peppery tasting salad greens are packed with folate, a B vitamin needed for heart health and protection from cancer. One cup has only 15 calories but supplies 70 percent of vitamin A needs as carotenes, also know for their eyesight-protection qualities. Strawberries: One cup of strawberries has only 45 calories, but supplies 130 percent of the daily value for vitamin C, a potent antioxidant, and the phytonutrient ellagic acid, known for its cancer-fighting power. Top your cereal or yogurt with strawberries or blend them with kefir for a quick recovery meal after a morning run.